Xbox One owners, your next match of Rocket League could pit you against someone playing on an entirely different platform. Today, the game about RC cars playing soccer with exploding balls became the first title to allow cross-platform play between Xbox One and PC. Before you rush off to the comments to point out how games like Killer Instinct were also compatible from Xbox One to PC and vice versa, know that there's a significant difference between how that cross-platform play works and how this cross-platform play works. For example, in the case of Killer Instinct, whether you played on Xbox One or PC, you were still connecting to Microsoft's servers. In Rocket League's case, you're connecting to Steam - making this the first, small step toward totally open multiplayer across all platforms. Regarding that issue, Microsoft said earlier this year that it would be open to connecting Xbox One with PS4, which places the ball in Sony's court. 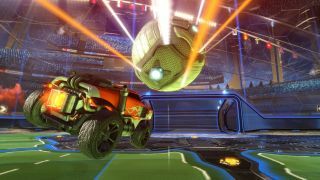 Hopefully Rocket League can prove to be a cross-platform success, and we'll soon be living in a future where we can all play together instead of bickering about which system is better. Hey, I'm allowed to dream.